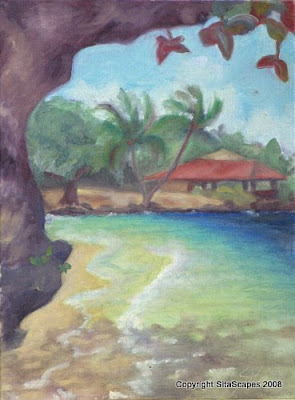 Artists Comments: The water a Spencer Beach is similar to pictures of the Caribbean shoreline. It has this amazing graduation of colors as the water deepens. Although I was not comfortable with my ability to paint shadows, I was captivated by the view from a little picnic table set so close to the shore that it got wet during high-tide. A large tree was also set amazingly close to the water's edge and cast a wonderful umbrella of shadows over the water creating a nice contrast against the brightness of the water. Once finished, I realized that my palm trees had a very pinwheel shape and once again learned how much I have to concentrate on painting what I see rather than letting my mind paint what it thinks the objects look like. This may sound like a simple matter but you would be amazed at the difficulty to being receptive to letting go of my pre-conceived ideas of how objects should be painted.